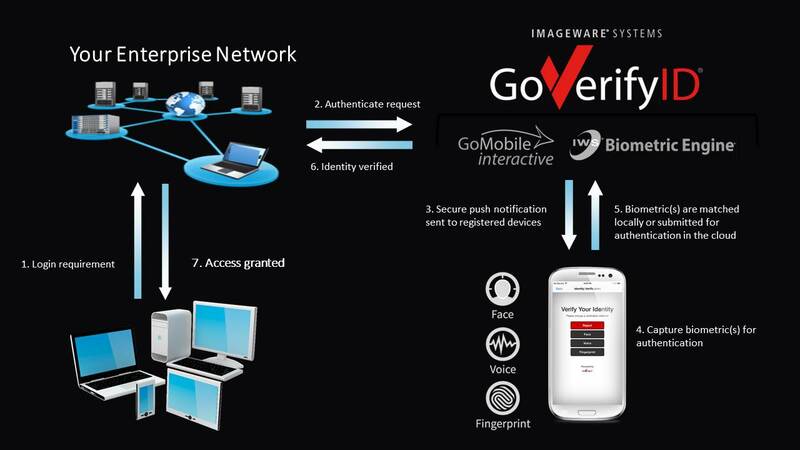 ImageWare Systems, Inc. (ImageWare) (OTCQB: IWSY), a leader in mobile and cloud-based, multi-modal biometric identity management solutions, today introduced GoVerifyID® Enterprise Suite, an innovative, multi-modal, multi-factor biometric authentication solution for the enterprise market. An algorithm-agnostic solution, GoVerifyID Enterprise Suite is the first ever end-to-end biometric platform that seamlessly integrates with an enterprise’s existing Microsoft infrastructure, offering businesses a turnkey biometric solution for quick deployment in an afternoon or less. Mobile-workforce friendly—With GoVerifyID Enterprise Suite user authentication logins are possible for a tablet or laptop even when disconnected from the corporate network. Additionally, GoVerifyID Enterprise offers a consistent user authentication experience across all login environments. Hybrid cloud—GoVerifyID Enterprise Suite is linked from the cloud to an enterprise’s Microsoft infrastructure and is backward compatible with Windows 7, 8 and 10. Additionally, because the solution is SaaS-based it can easily scale to process hundreds of millions of transactions and store just as many biometrics. Seamless integration—GoVerifyID Enterprise Suite is a snap-in to the Microsoft Management console and can be centrally managed at the server. Additionally, the solution allows for seamless movement as it integrates with Active Directory using an organization’s existing Microsoft security infrastructure. Ultimate freedom—ImageWare has extensive relationships with leading biometric algorithm vendors, and its Biometric Engine is specifically designed to easily add and support new biometric algorithms, future proofing a corporation’s investment in GoVerifyID Enterprise Suite. A pioneer and innovator in biometrics for decades, ImageWare reinvented the biometrics field with its algorithm-agnostic, real-time and ultra-scalable Biometric Engine®, which was granted the “Product Innovation of the Year Award” by Frost & Sullivan. Additionally, the company’s GoMobile Interactive® product was recognized by CTIA, the Wireless Association, receiving First Place Award for Emerging Technology (E-Tech) in the Mobile Money, Payments, Banking & Commerce category. 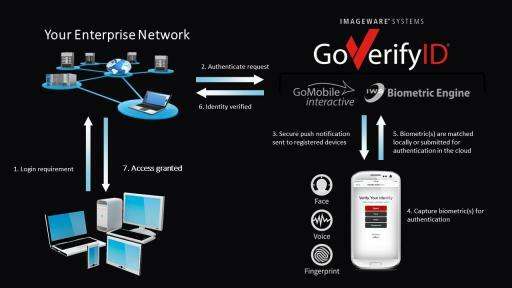 Together, the Biometric Engine and GoMobile Interactive form the basis of the GoVerifyID Enterprise Suite cloud component. ImageWare Systems, Inc. is a leading developer of mobile and cloud-based identity management solutions, providing biometric authentication solutions for the enterprise. The company delivers next-generation biometrics as an interactive and scalable cloud-based solution. ImageWare brings together cloud and mobile technology to offer multi-factor authentication for smartphone users, mobile clients, and desktop devices. ImageWare’s products support multi-modal biometric authentication including, but not limited to, face, voice, fingerprint, eye, DNA, and more. All can be combined alongside other authentication and access control facilities, including tokens, digital certificates, passwords, and PINS, to provide the ultimate level of assurance and accountability for corporate networks, web applications, mobile devices, and PC desktop environments. ImageWare is headquartered in San Diego, Calif., with offices in Portland, OR, Ottawa, Ontario, and Mexico. To learn more about ImageWare, visit http://iwsinc.com or follow us on Twitter, LinkedIn, YouTube and Facebook.